Nam Nguyen awarded the NASPA Region V Undergraduate Rising Star Award. 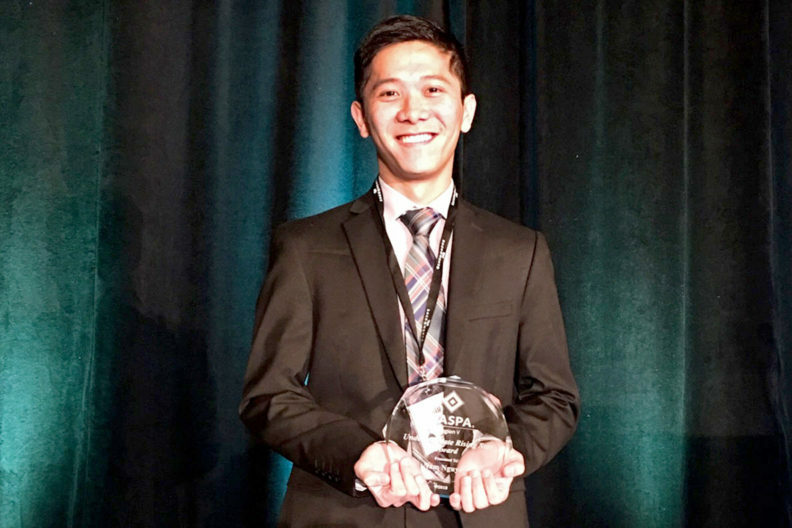 Nam Nguyen, a Washington State University international business and marketing student, has been awarded the Region V Undergraduate Rising Star Award from the National Association of Student Personnel Administrators (NASPA). Nguyen received the award this month during the NASPA Student Affairs Administrators in Higher Education’s Western Regional Conference in Sacramento, California. Matthew Jeffries, director of WSU’s Gender/Expression and Sexual Orientation Resource Center (GIESORC) and Nguyen’s NASPA undergraduate fellow mentor, said he couldn’t think of a more deserving student to nominate for the award. “Nam is the most involved, committed and productive student that I have ever known,” he said. Pamela Duran, associate director of WSU’s International Student Center, is equally impressed. “Nam is one of the most curious, hardworking, smart and determined students I have ever known,” she wrote in her letter of support. In addition to being a NASPA Undergraduate Fellow, Nguyen is a Carson College of Business Fellow, Ronald E. McNair Scholar, an honors student, a member of the President’s Commission for Gender/Expression and Sexual Orientation, a member of the Office of Student Conduct’s Academic Integrity Hearing Board, and recently interned with the Pride Foundation in Seattle. “Nam embodies this award as a strong, smart, compassionate and passionate advocate, particularly for the needs of students, especially those who may be marginalized because of their race/ethnicity, geographic location, sexual orientation and/or gender identity,” said Gunner Scott, Pride Foundation director of programs. NASPA is one of the nation’s leading associations for the advancement, health and sustainability of the student affairs profession. It provides professional development, advocacy and research for 15,000 members in all 50 states and 25 countries. NASPA Region V encompasses the states of Alaska, Washington, Oregon, Idaho, Montana, Nevada, Utah, and the Canadian provinces of Alberta and British Columbia. Others supporting Nguyen’s nomination include Chad Gotch, assistant professor in educational psychology; Christine Oakley, director of Global Learning; and Mayra Villegas, an advisor in WSU’s Global Learning Program.